Back in June I sat with baited breath in front of the laptop. I had entered the “virtual queue” established by the promoters of New York Comic Con. This is the only way to obtain the privilege of purchasing tickets to the biggest, most spectacular comic convention on the east coast. My goal was to nab tickets for Friday and Saturday for myself along with a Sunday adult and child’s ticket for both myself and my daughter. After following all the prompts, keeping my fingers crossed and dusting the keyboard with sage, I had accomplished the unthinkable-tickets for all three days! 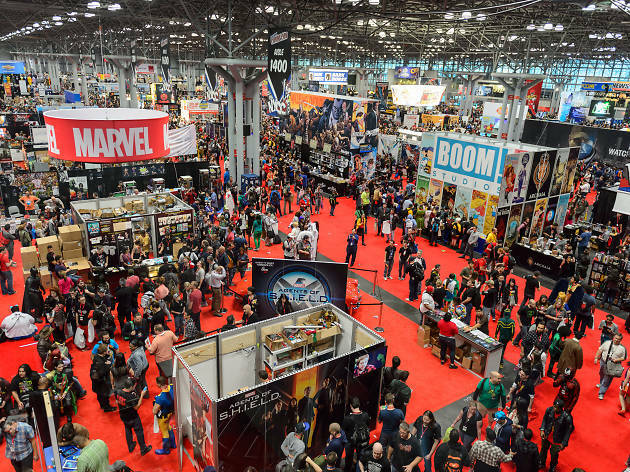 Now, you have to understand, I’ve been attending NYCC for years but I’ve never gone three days in a row. This was unprecedented. What would I do? How would I spend my time most effectively? What would I wear? Really, that last question was the most important. While New York Comic Con is known for its amazing panel discussions, celebrity signings and wide variety of vendors; I’m mostly in it for the costumes. I admit it. I’m fascinated by the dedication and creativity of “cosplayers“; the Comic Con attendees who don intricate, exacting and sometimes obscure costumes derived from the worlds of comics, pop culture, video games and more. I’ll never be a “pro” cosplayer but I do enjoy entering their world for just one weekend a year. I usually decide on a costume a few weeks in advance, coordinate with my daughter and have a blast mingling with the hundreds of super hero doppelgangers who roam the convention floor while snapping photos and selfies . This year however, things would be different. I had an idea. One costume is great…but what if over the course of my comic con adventure, I became a different character each day? Genius! I resolved to transform myself into three distinctly different individuals and record my experiences as each. Who would be the most popular? The most fun? The most difficult to pull of? This was going to be fun, but would require some serious thought. Fifteen grueling minutes later, costume number one hit me like an umbrella across the forehead…I would become criminal mastermind, Oswald Cobblepot…also known as…THE PENGUIN! Truth be told, the costume was not that difficult to put together. One trip to the nearest Spirit Halloween shop and I had everything I needed to pull of as close a facsimile of the Danny DeVito version of the Penguin from Batman Returns as possible. I even found a prosthetic nose that could be held in place with theater glue and pale grey face paint to give myself a sickly but frightening countenance. The coup de grace however, was the umbrella. In case you’ve been hiding under a rock since the 60’s when Burgess Meredith made the Penguin a household name in the campy Batman television show, the Penguin carries around umbrellas that double for concealed weapons. Lucky me, we had am umbrella lying around the house that was a souvenir from the Broadway production of Mary Poppins. Its parrot head at the top of the handle was an ideal accessory for a villain whose motif is birds. I highly doubted anyone would even remember what the Mary Poppins umbrella looked like, so my chances of being called on it were minimal. Finally, day one arrived…after about an hour of prepping the look, off I went through the Lincoln Tunnel and into the Big Apple to take my place amidst the huddled masses of geekdom disguised as an evil super villain. 11:15 am: Things begin to substantially look up when I stumble upon a duo cosplaying as the Michael Keaton and Michelle Pfeiffer versions of Batman and Catwoman from Batman Returns! My castmates! I immediately know that this has all the makings of a fantastic comic con photo. Catwoman readily agrees to have her picture taken with me but her partner is more reluctant. I quickly get the sense that he’s the jealous type as he gives me some serious Bat-side eye from behind his immovable cowl. Eh, screw you, Bats! I’m the bad guy, right? I’m getting this photo whether you like it or not. As Catwoman rests her claw on my shoulder and I strike a dignified pose, I can feel the heat coming off Batman’s rubber armor. It’s apparent he’s not a fan. I quickly thank my photographer, waive my Mary Poppins umbrella and go on my merry way, living to fight another day! 1:00pm: After a completely overpriced lunch consisting of convention chicken fingers and fries, I head back to the crowds. “Hey, it’s the Penguin, that’s awesome!” I hear a muffled voice exclaim. I turn around and am both startled and awed, by one of the best costumes I’ve seen all day; Man-Bat. Yes, Man-Bat is exactly what he sounds like. A Man-Bat hybrid who is one of the lesser known nemeses of Batman. This costume is absolutely amazing and I am humbled when Man-Bat suggests that we take a photo together. A very nice passerby offers to do the honors, snaps the shot and I quickly turn to again tell Man-Bat how great I think his costume is, only to catch my now infamous umbrella on the edge of his wing, knocking a piece of what probably took months to create right off the edge of his intricate ensemble. It was probably the first time in history that a penguin was red faced. “No big deal.” said my enormous friend as he quickly snapped the wayward piece back onto his costume and took his leave. “Wow.” I thought, “That giant costumed freak was a real gentleman“. 3:00 pm: I hit the vendor floor and am astounded by the enormity of my surroundings. From one end of the convention to the other, dealers are selling classic comics and trade paperbacks, vintage toys, costumes, t-shirts and accessories. I stop to admire some truly beautiful superhero themed artwork, when I am beckoned into a booth by an imposing yet affable man who introduces himself as the very artist responsible for these masterpieces. I am wary. I have no intention of hearing the screams of my wife when I return home with of all things, a $500 painting of a comic book hero. Yet, despite my preconceptions, what I thought would become a hard sell for some costly artwork instead became a very interesting discussion with a gentleman who loves his medium. In the end, he merely wanted me to pose with him, alongside a painting he had created of The Penguin. Of course, I had to oblige. It’s not often that super villains are the subject of such lovely pieces of art. Besides, I’m sure that the Joker will be so envious when he sees what a big deal I am! 5:00 pm: I’m getting ready to pack it in. This has been an extremely fun day but my delicate penguin feet are begging for a rest. Tomorrow will be another adventure in a completely different costume. As I head for the door, an effusive middle aged woman jumps in front of me. “Wait!” she shouts. “You have to take a picture with my husband!” I turn to my left and realize that while it had been fun playing the part of The Penguin all day, I have been completely outclassed. Before me stands a version of The Penguin, dressed in a luxurious bathrobe, wearing a nightcap and fuzzy penguin slippers. I gotta give it to the guy. He went all out and gave the character an entirely unique spin. While I had thought that handling out fake Penguin campaign literature was a clever use of props for my cosplay, this dude went above and beyond. Lesson learned. The Penguin was well liked by many, if not all convention fans, but he is by no means an obscure character. In order to achieve that extra “something” my goal should have been to stand out rather than to trying to impersonate Danny DeVito. Touché , bathrobe Penguin…touché. Well, that’s a wrap for Day 1, If I had to guess, I’d say that The Penguin was pretty well received. He proved to be a tough character to “make my own” but most convention-goers easily recognized the costume and many admired the effort that went into creating a Penguin that was both frightening and sophisticated. I’d give myself 7 out of 10 with a note to self that personal twists on the character can be a lot of fun. This does not, however, include utilizing a Mary Poppins umbrella as a costume accessory unless you are actually cosplaying as Mary Poppins. I leave beyond excited for what Day 2 will offer, wondering if my costume will garner more or less attention than today’s. Time to waddle back home and get ready! See you back on the convention floor next week for Day 2 of My Comic Con Diary! Now, somebody help me find the glue remover. My nose has been itching all day!